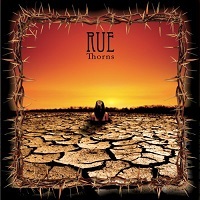 Last heard from in 2003 (which frankly, seems like eons ago), Midwestern sludge metallers Rue return with Thorns, their second full-length. While their extended absence might have provided them with ample time to re-stock their creative juices, Thorns unfortunately, simply has too many songs and not enough good ideas to make any kind of a dent. It’s an album that hits often and early, but fails to keep its momentum. Singer Jeff Fahl doesn’t have much to work with, oftentimes having to pick his spot over re-used dinge riffs of the Kyuss variety. He does however, have a biting melodic snarl to him, not terribly unlike Kyuss’s John Garcia or even one-time Corrosion of Conformity vocalist Karl Agell. With the aid of more complementary (and less derivative) material, Fahl could emerge as one of the better pure rock/metal vocalists in North America, especially if he loses his silly grunt approach. On one hand, it has to be really easy to be a sludge band right now considering the pure strength in numbers. Yet on the flipside, a band like Rue cannotafford to stumble, especially after such a lengthy time away, something they did quite frequently on Thorns.